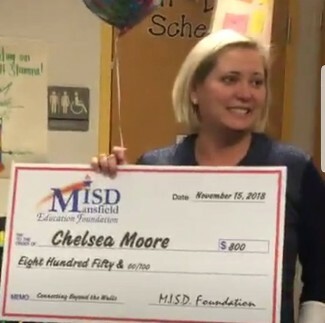 Chelsea Moore, Reading Specialist from Elizabeth Smith Elementary School, receives a grant from the Mansfield Education Foundation. Her grant titled "Connecting Beyond the Walls" will provide webcams and microphones for every grade level to connect with experts as well as other students from across the globe. This innovative learning approach is a focus for ESE. Mrs. Moore is "so excited to be bringing webcams to the classrooms for our amazing ESE Stallions to become global learners!" Congratulations, Mrs. Moore!